Don’t know what to do with your latest floral bouquet? Try creating a beautiful timeless décor item out of it. Natural Treasures has been helping keep your memories alive for over 15 years! At Natural Treasures, I can custom make preservation designs that you envision. Specializing in wedding bouquets and memorial flower preservations, I will make sure your memories last a lifetime. Floral preservation is a process that extracts the moisture from flowers while maintaining the dehydrated state. It will seal the flowers to protect their natural shape and color. The quicker you start the preservation phase, the easier it is and the more color you will receive in your floral arrangement. With my professional touch and experience in the floral industry, I will create a beautiful piece you will enjoy for many years. I understand that your bouquet was designed especially for your wedding day. 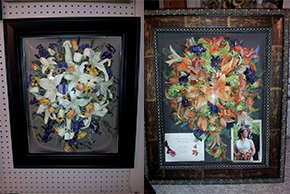 At Natural Treasures, I will create a unique design either framed or in a shadow box to your specific requirements. Please feel free to bring in other keepsakes to arrange in your design as well. Anything from invitations and programs to necklaces and pins can be added. With years of experience in floral arrangements, I understand how to handle them carefully and quickly to achieve the bright color and size of your preservation. Natural Treasures is just a short drive away from the Westminster, MD area. Please stop in to see examples of the beautiful pieces that have already been created.